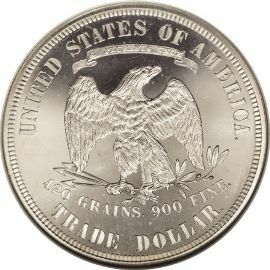 Trade Dollars were coined at the US Mint from 1873 to 1885. Circulation strikes of these coins only ran through 1878, with the remainder being proof only issues. The last two years of 1884 and 1885 are exceedingly rare, with only 10 and 5 respectively. The origin of this coin grew out of the need to dispose of large amounts of silver being found in silver mines in the west. Since the US Mint was limiting the amount of silver coins being made after the Civil War, due to widespread hoarding, miners had to find another outlet for the metal. The mining interests discovered another market in Asia, namely China. The Chinese had shown a decided preference for silver coins, and up to then the bulk of American trade with China had been carried out with Spanish and Mexican dollars. This coin had a higher silver content, making it even more inviting to the Chinese. The designer William Barber even had its superior content inscribed on the coin as "420 GRAINS, 900 FINE." Most all of these coins were exported to China at one time or another. At first glance, this dollar looks allot like a regular silver dollar. 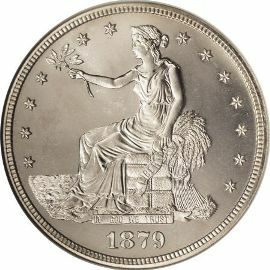 It's the same diameter and about the same weight as its predecessor, the design of the Seated Liberty dollar is very similar. It is of a seated female figure representing Liberty on the obverse and a naturalistic eagle on the reverse.